We are committed to providing quality public services that provide value for money for our residents. for money services to our residents. We believe that the recruitment and retention of high-quality staff is vital to our success and so we take care of our staff offering a range of flexible and family friendly working arrangements and a package of employee benefits. We aim to create a positive working environment enabling our employees to work to their full potential and achieve a healthy work/ life balance. Boston Borough Council firmly believes that health, safety and welfare is of paramount importance. We will ensure all reasonably practicable measures are taken to safeguard the health, safety and welfare of our employees, visitors, members of the public and anyone who may be affected by our activities or use our buildings. Boston Borough Council, through its Corporate Management Team, Senior and Service Managers and elected Members will ensure that all of our activities are conducted in a manner which thoroughly identifies and controls foreseeable risks in accordance with current legislative requirements recognised guidance and best practice. provide information, training and skills development for all employees to enable them to carry out their duties. provide and implement in each workplace, procedures to ensure a safe and healthy working environment. systematically measure, evaluate and promote the progress made in the implementation of these principles. conduct their activities in a manner which minimises the risk to their own health, safety and welfare and that of their colleagues or others who may be affected by their actions. with specific responsibilities for health safety and welfare, for example Managers and Supervisors ensure that their duties are adequately discharged and covered in the event of absence by an appropriate deputy or responsible person. must bring to the attention their line management any hazard, dangerous practices or incidents of which they become aware. It is Boston Borough Council’s policy to utilise all resources available including the Trade Unions and Health and Safety Working Group and to encourage a positive and constructive approach to health and safety. We therefore welcome all suggestions and recommendations which might lead to a safer workplace and improved work practices. Boston Borough Council, Corporate & Service Management Teams and I give full backing to this policy and support all those who take action to implement it. We are committed to providing quality public services that provide value for money for our residents. In order to do this we must employ high quality staff and reward them appropriately and fairly. In today’s challenging economic climate we must also ensure that we control our employment costs. The mean gender pay gap at Boston Borough Council is 11.1%. The mean hourly rate for male employees is £13.14 and £11.69 for female employees. The median gender pay gap at Boston Borough Council is 2.2%. The median hourly rate for male employees is £10.47 and £10.24 for female employees. The chart below shows the gender profile across quartiles at Boston Borough Council. 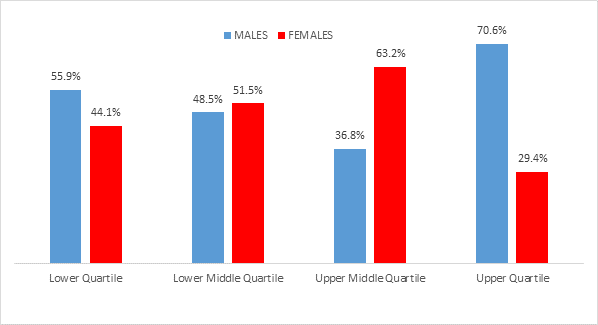 There are more female employees in the middle quartiles than in the upper quartile, which has contributed to the gender pay gap at the council. As the Council does not award bonuses, any calculations in terms of gender pay gap in relation to this are not applicable. You can view all gender pay gap reports including Boston Borough Councils for the current and previous years on the gender pay gap service website.